Year after year I waited for Ed McBain’s new books like a kid waits for Christmas, books that he produced with certain regularity. Not even once was I disappointed. This writer delivered the goods not because it was expected of him, but because he was a man born to write. Evan Hunter or Ed McBain (October 15, 1926 - July 6, 2005) was a prolific writer—thank God! I will let others tell you about his life, his accolades, and other merits; for now I only want to comment on one of his early novels: The Gutter and the Grave. Just because the novel is an early production (1958), do not for a second think that it is a novice’s work. Not at all. A few days ago I re-read it and I want to share my impressions as to what makes this novel a delightful reading. Notice in the above excerpt how the repetitions “He tried not to notice” which coupled with the repetition of the coordinating conjunction ‘or’ achieve a melodic effect. Not only are these constructs —nominative absolutes— of the English language tough to handle, they are confusing; as a result many writers don’t use them. Not Ed McBain. He is the master of the absolute. And he uses them in their different varieties: “You wouldn’t know a voice from a hearse.” Laraine said angrily, her eyes blazing. [Noun followed by present participle]. “I guess Johnny Bridges saw the initials at the same time I did because he let out a short sharp scream and then whirled to me, his eyes wide with terror.” [Noun plus preposition]. “And so now, coming back into the living room, she sat with her back stiff and the big bosom thrust forward high and proud, her knee and feet close together, her chin lifted, the fine bones of her face glistening wetly.” [Combinations of nouns followed by past tense and the present participle]. “… the hips flaring out below that, childbirth hips covered with a black skirt taut over firm thighs and good legs.” [Noun plus past tense]. "I only wanted to stun him, and stun him I did." Without abusing them, we find rhetorical figures throughout the narrative, as in the above example of anadiplosis, where a word or words that end one structure begin the next. Besides the points I mentioned above, I could go on about McBain’s techniques to build suspense, crisp dialogue, and character development. But that is material for another article. Taking a backward glance I imagine and see a sky studded with effulgent stars: Tolstoy, Flaubert, Hemingway, Fitzgerald, and others—but I also see the Ed McBain twinkle in their midst. 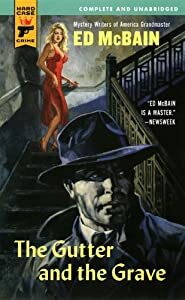 Comments on "Ed McBain’s The Gutter and the Grave – An Appreciation"